Go for healthy skin that feels great with the By Kelsha serum. 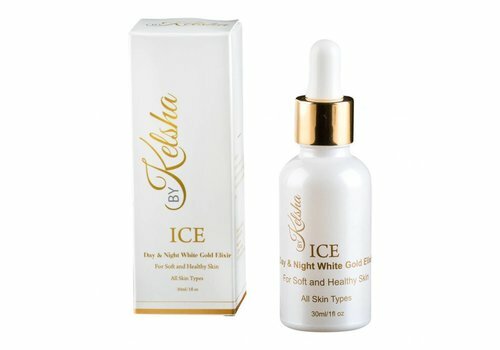 These serums contain 24K gold flakes that provide hydration and care of the skin. Your skin will shine like that of a known star. Lines will be visibly reduced. Shop the complete range of By Kelsha easily and quickly at Boozyshop. The By Kelsha range consists of only 2 different products. The Serums by By Kelsha are versatile that you only have enough of this product. This serum replaces your day cream, primer and anti wrinkle cream. The serum contains 24K golden people that moisturize and care for your skin. Use the By Kelsha serum as primer day cream and anti wrinkle cream. When you use products made from natural ingredients, your skin will shine and look healthy. So go for products without alcohol and perfume. Your skin will no longer feel dry or heavy. You will find that when you use the delicious products of By Kelsha that your skin will shine again. The delicious serums from ByKelsha look luxurious because of the golden flakes in the product. These beautiful luxury serums in a beautiful package are exactly what you are looking for if you want to shine like a star. Road dullness, hello shiny healthy skin. Shop the complete range of By Kelsha easily and quickly at Boozyshop.